The AMS-Oiler® is a high-tech oil pre-charger that puts an end to potential dry-engine starting. Typically, an engine that has sat for even a short period of time will operate relatively dry upon starting before oil is able to fully lubricate the system. 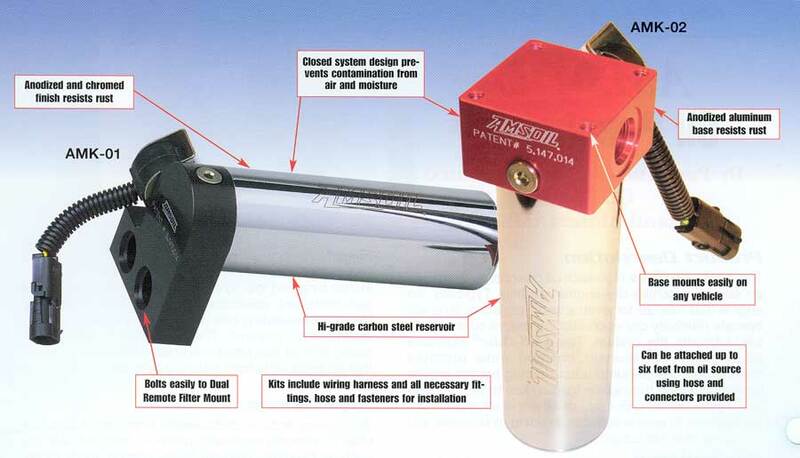 While every engine could benefit from use of an AMSOiler®, vehicles especially prone to frequent starting, such as taxicabs, delivery fleets, marine applications, service vehicles and many family and personal vehicles, would extend their engine life with the simple addition of an AMS-Oiler®. Engines that sit idle for extended periods of time, such as in farm, service, recreation or marine equipment, are given more time for the oil to drain down, resulting in increased wear during dry-starting. An AMS-Oiler® can provide the instant lubrication necessary to save these engines significant wear and prevent damaging metal-on-metal contact. 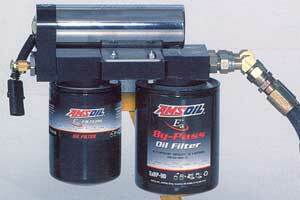 The AMS-Oiler® is a high-tech oil pre-charger that puts an end to potential dry-engine starting. Typically, an engine that has sat for even a short period of time will operate relatively dry upon starting before oil is able to fully lubricate the system. The AMS-Oiler® operates as an engine oil reservoir, charged under pressure directly from the oil pump output during normal engine operation. 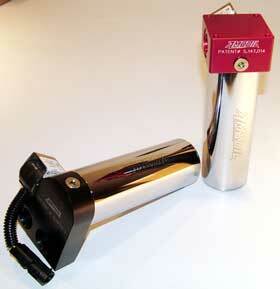 Upon turning the ignition key to the on position, up to 160 cc's (5.4 oz.) of oil are discharged from the reservoir to engine surfaces, building oil pressure and providing vital lubrication. With an extremely rugged hi-grade carbon steel reservoir and anodized aluminum base, the AMS-Oiler® is crafted to withstand severe service and to perform reliably in any personal, commercial or industrial application. Unlike other pre-charger systems, the AMS-Oiler® has no bulky moving parts which need maintenance and does not rely on pressurized gas to function. Unlike air-actuated competitors, the AMS-Oiler® can be mounted at any angle and discharges oil even under the most severe conditions. The AMS-Oiler® is substantially smaller, more convenient to mount and safer than large, bulky, pressurized gas devices. 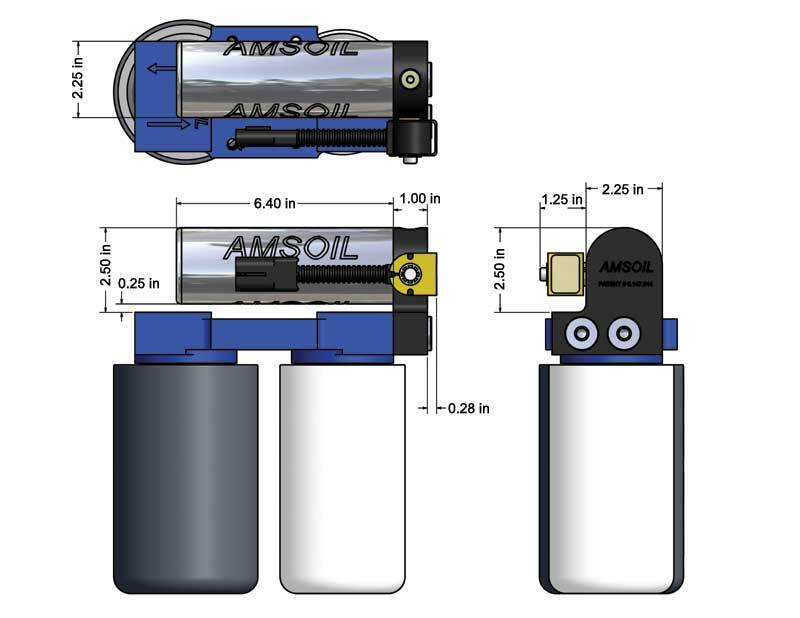 Pressurized gas units AMS-Oiler® Oil Precharger By-Pass/Dual Remote Mounted (AMK-01) & Stand-Alone (AMK-02) range from 18 to 21 inches long with a diameter up to four inches, while the AMS-Oiler® is only about eight inches long and four inches wide. The AMS-Oiler® is a self-contained, streamlined unit that has a mechanical life cycle exceeding one million engine starts, with no maintenance required. The AMS-Oiler® is self-lubricating with an integrated overpressure protection device that protects units from retaining pressures in excess of 65 p.s.i. The AMS-Oiler® outperforms gas and air charge systems. With the turn of a key to the on position, an audible 95 db signal will sound for two seconds while a 12-volt DC solenoid initiates the unit's operation. When the oil delivery process is complete, the signal will cease and the operator can start the engine. The absence of a gas or air charge eliminates the possibility of cross-contamination of dirty gas or air with the engine oil, keeping the oil pure and performing optimally.